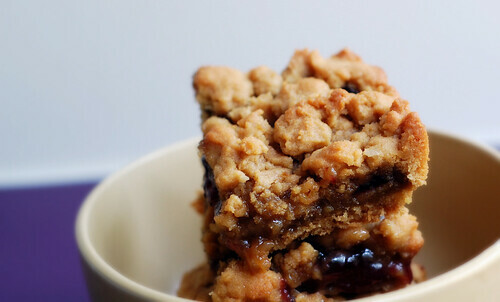 Layered crumbly peanut butter and jelly bars. Preheat oven to 350 degrees F. Grease an 8x8-inch baking dish or an 11x8-inch. In a medium sized mixing bowl, sift together flour, baking soda and salt, whisk in cracker crumbs until combined. In a large mixing bowl, using a mixer on medium speed, beat together peanut butter, butter and brown sugar until creamy, about 1-2 minutes; beat in eggs and vanilla until combined. Reduce mixer speed to low and beat in flour mixture until just combined. Evenly spread half of the cookie dough into prepared baking dish. Bake for 10-12 minutes or until golden brown around edges. Remove dish from oven and evenly spread jelly over the surface. Dot the top evenly with remaining cookie dough. Return dish to oven and bake an additional 15 minutes or until golden brown. 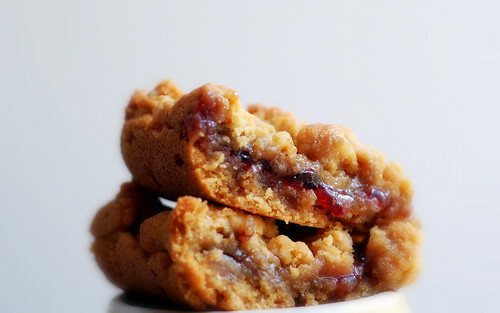 51 comments on "Peanut Butter & Jelly Bars"
OMG - these bars look so good! I have never tried grape jelly, but I'd be happy to give it a go. I agree with the kids at school and the prohibition on going to the loo - when you gotta go, you gotta go, and my friends and I can all think of some pretty near misses when we tried to hold on so we didn't have to face the embarrassment of asking to go in class. This brings back memories. The combo of peanut butter and jelly was a staple of my childhood. I don't mind re-establishing this memory. You write the best things Em! Going back to school after a fun filled summer is always hard. Especially those first few weeks when it's still warm and all you can think of is swimming! I gotta hand it to you, these bars look delicious...you are a genius! I was going to mention the oven mitts, before you even said anything. I don't wipe the knife off, I use TWO knifes. Actually, I use a spoon for the seedless raspberry jam that takes the place of the grape jelly. I once saw someone spread peanut butter on both halves of the bread and THEN put the jam on top of THAT. Isn't that wild? Oh wait, that was my son and he said he invented that method. You really get a maximum hit of pb and j that way. THANK YOU!! I used to hate that in school too, when you needed a hall pass or whatever to use the freaking restroom. Sheesh, haha. On a brighter note, hellll yes for the classic PBJ in a dessert-y form. Holy yum. Those look yummy! I think I will make them for a back to school suprise for the lunch boxes. Only 18 days left of summer vacation. Those PB & J bars look so delicious and moist! I made some a few months back but these look fantastic, I may need to make some more but try out your recipe. And I totally agree with the restroom thing at school. Its been 5 years since I graduated high school, but I still remember having to swap out detentions with my teacher in order to take a bathroom break! Yay for peanut butter jelly time, they look delicious! I was a picky eater growing up and always took PB sandwiches to school (no jelly! ), how horrible is that? Nice touch with the crackers. These bars do look delicious. Men can be so helpful when it comes to "testing" the final product, can't they? what a lovely assistant. :) meanwhile, it’s inevitable that whenever iread the words “peanut butter and jelly,” that cursed “it’s peanut butter jelly time” song pops into my head. grr. Peanut butter and jelly have to be one of the best combinations on the face of this planet! I made these bars awhile ago and they were fabulous! I love PBJ bars!!! I'd much rather have those than a PB&J anyday. Believe it or not I've never eaten one. My Mom didn't make 'em. Btw, my guys are happy to get back to school and hang with friends...new school supplies & clothes! Nothing like a pb&j dessert! these look great... and yeah, some teachers were a little crazy about not letting kids go to the bathroom. i understand it was because some kids abused it just so they could go hang out in the hallway for a while, but if you've gotta go, you've gotta go. Wow! You've converted my favorite snack into a dessert!! Thank you!! And lol, I love Eric's involvement in making it!! 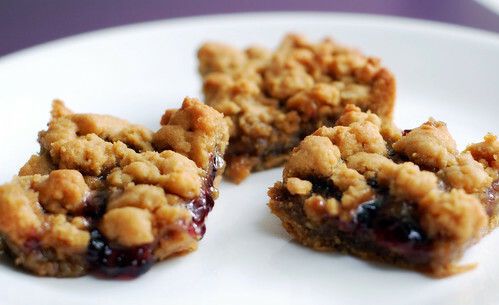 Peanut butter & jelly bars by Ina!! I've wanted to make these ever since the first time I saw that episode... right on!! You're looking kind of buff! These look de-lish. Love the crackery addition! Do I detect a little haha to all those little youngun's you're talking about having to go back to school? Don't worry. I feel the same when I send mine back after summer is O-VER! ;)I remember one of my best friends in third grade sat right in her chair and wet her pants all over the place because she was scard to ask to go. Why do they make such a big deal? Sheesh, when you gotta go, you gotta go! I totally agree about the bathroom thing! That is just outright cruel & unusual punishment if you ask me! I would eat the whole pan...How do you make so many delcious things and stay so thin!?!?! I spend a whole lot of time making PBJ sandwiches since my bfs 5 year old likes to live on them . . . He doesn't like crust so I find it's fun to create different shapes (his favorite is a smiley face so he can make it frown because it knows hes going to eat it) . . . I'll have to try these out on him!! Haha- Sue, that is wild, wild stuff. I actually use your technique with the spoon now that I think about it. Amy, wow! I like that. I think I get more muscular during the summer from lifting so many heavy trays. You had me at the mere mention of peanut butter, not that you need an assistant but I am sure it was fun. It's peanut butter jelly time :D! I'm loving the Christmas oven mit :)! I hated that rule in school, I was always paranoid. I think it should be illegal, seems so inhuman. What a treat for the kiddos! I can't believe you got in trouble for using the bathroom. I think now they would have an issue with that because if you hold it you will get a UTI. I wonder how many teachers are aware of how easy it is to get a bladder infection?? I'm so glad I don't have to go back to school!! But I'll eat anything with a pb&j theme any day! I'd take this over a PB&J sandwich any day! I had to laugh about the bathroom thing at school... so true! For one, I hated using the bathroom at school! MMMMM I may need to make these up with some of my home made jam YUM!! 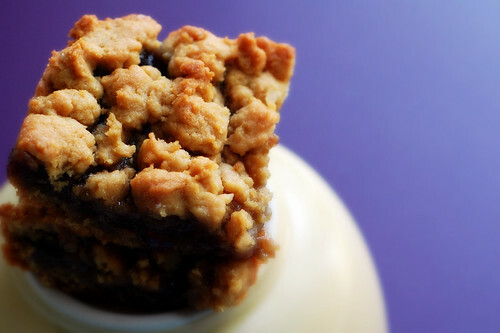 LOVE pb&j bars - and your look so yummy!!! omg i would be so happy to find these in my packed lunch! and i totally agree with you; why is there a limit to bathroom usage in elementary school?!? i'm singing--peanut, peanut butter. and jelly :) these sound amazing! You guys are too cute! 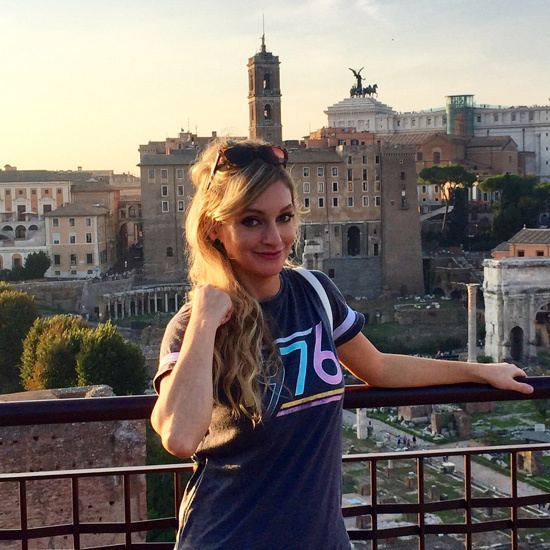 :) I loved this post, Emily! I agree the bathroom thing is terrible...and I agree that these bars will make a day at school go down better! You made me laugh several times today. my husband loves you. he is the biggest pb and j fan out there. thanks emily! wow! i'm going to try this right now! Indeed. I hear trees grow well in peanut butter soil.